A new year has begun and already the first month is coming to an end! Time continues its inexorable march! January is often the month when we set new goals for the year and plan significant milestones. We resolve to bring about changes for the better. While it’s sometimes easy to set goals, the harder part is to trigger the behavior changes required to achieve those goals! In the startup world, I often see many examples of brilliant founders who have grown from seemingly inconspicuous beginnings to achieving global recognition. How do they do that? What is it that distinguishes success from failure? Brad Fogg was a behavioral scientist at Stanford University when he created the Tiny Habits Program. He surmised that if you build small, achievable habits, you are on the way to achieving larger goals. Successful people follow a process of consistent learning, developing tiny habits or patterns that drive them to succeed at bigger goals. The idea behind it is simple and universal. Small changes add up when done consistently. Change is most apparent when implemented slowly with consistency and discipline. And change is most lasting when habits become ingrained in our mind. Yes, we all make resolutions. But we struggle to keep them! At times, the effort lags because the motivation tapers off. Or sometimes, our motivation and effort may be strong, but we may lack the skills to reach those goals. What’s worked for me is to pick two or three habits that I think would affect my life positively. I pick habits that may seem insignificant and unconnected to success. For example, when I read about Fogg’s method, he mentions in one instance how most people don’t floss, though they know they should and it only takes a couple of minutes. Flossing regularly was one of the changes I wanted to bring about in my life! Yes, that is me! Brad suggested that you create a habit of flossing just two of your teeth. It sounds ridiculous. But I decided to start flossing a few years ago using this method and, honestly, now this is such an integral part of my routine that I can’t go to bed without flossing! Obviously, dental hygiene may have nothing to do with being successful but developing the ability to create habits that help you achieve your goals is integral to success. Introspect about the changes you want to bring in to your life. It could be, as above, writing more. Or communicating better at work, committing to a fitness regimen or just reading more or appreciating your spouse. Whatever the change you are thinking of implementing, the important thing to consider is that it should be something that you really want, it should be simple, and should be something you feel you can achieve. And as explained earlier, start small. 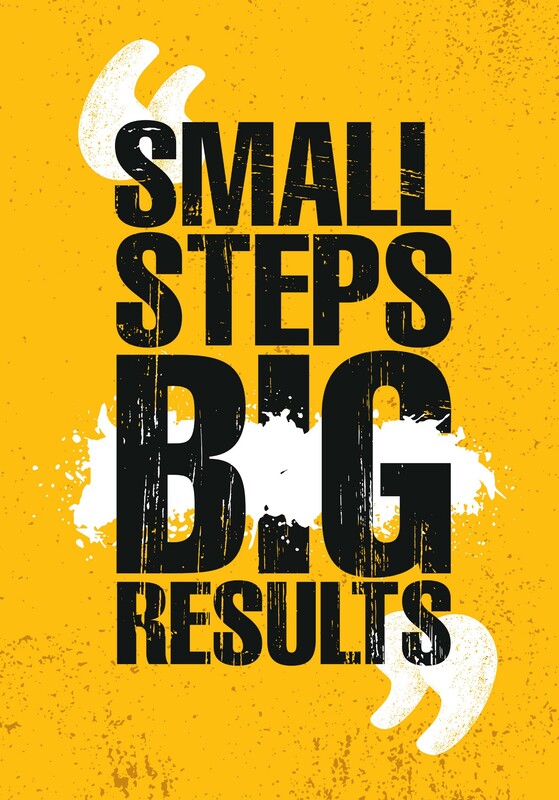 A big change should be broken into smaller steps. Create no more than two or three habits changes at a time. Stick to those habits until it becomes second nature to you. Preparedness: Be it life or work, we often come unprepared. I have often seen people harried during a meeting. It’s their lack of preparedness that leads to that stress! If we make it a habit to always come prepared for a meeting, we will reduce that stress. If I have to give a talk, I break it into research, script, presentation, and practice. Then, I allocate how much time I need for each unit. I then add this to my calendar with adequate buffer time. Generally, I have a habit of breaking everything into small discrete tasks. This habit works great for me whether it is hosting 100 people for dinner or delivering a keynote address. Organization: We often find ourselves complaining of lack of time. Yet, we all only have 24 hours! I wanted to develop the habit of waking up early. This was a tough habit for me to master, admittedly, but now it has become easier! I know the only way I can get personal time for myself and to reflect, which defines having a good, organized start to my day, is to wake up early. But waking up early is often difficult for many of us! Here’s where habit training can make a difference. It sounds simple, but to wake up early, you have to get into the habit of sleeping earlier and, perhaps, eating earlier. It requires making several changes to our lifestyle that might seem challenging to stick to! No caffeine after 2PM? Check. No screen time after 10PM? Check. No stressful conference calls post 9PM? Check. Each of these ‘checkpoints’ may appear to be such simple habits, but it is difficult to achieve all of them at once! Hence, the tiny habit way would be to pick one thing first and stick to it. The way to stick to it is to visualize why you want to achieve this goal and savor the feeling when you achieve it. Over time, it triggers a whole process of behavioral changes! Focus: Today, we are constantly distracted. The constant ping from our smartphones. The notifications, the buzz. We are connected to the world, but are extremely disconnected in terms of focus! One reason why I never bring my phone to meetings! Sometimes, I have had entrepreneurs answer the phone during the meeting, only to say “I will call you back!” I have also seen that there may be two or more founders who come for the fundraising pitch. While one is presenting, the other person is lost in their phone texting! Surely, your phone can wait the hour when you are pitching for funding! Checking the phone constantly is a bad habit and takes away focus. Working this way enables you to understand the effort to complete a task. Communication: Good companies become great with great teams. If you want to change the way you communicate, consider doing the little things. Make it a habit of showing appreciation more often. Instead of focusing on self-achievement, try helping someone else in your team achieve their goals. Make it a habit to check your email for spelling errors, set aside the draft for a day if it is a critical mail, and reread before sending that email! Any habit, even the tiniest one, works best when you have others to motivate you to achieve it! When you have a strong support system or friends who cheer your every milestone, it becomes more difficult to give up! Sometimes, we make a habit of giving up. But we can also reverse this process and not make it a habit of giving up! Ultimately, I have found that this simple art of creating long-lasting habits contributes to more substantial changes. Changing your habits on purpose and with intent is one of the most rewarding things you can do in your life. This is how you will understand yourself, your career, and life. It’s about showing up every single day and creating a new behavior that you have decided is important to you. And that is a reward in itself.